I first became aware of the Elemental series when I tried to get hold of a bottle of the Oxygen Blended Grain Whisky after seeing a bit of marketing blurb on another site, I enjoy grain and really enjoy the Blended Grain from Compass Box so this intrigued me and so it was that I became aware of the whole series. These are travel retail only, this annoys me, I only go abroad once a year so my chances of picking up anything travel only is slim and when it’s something limited and I can only hope that I can pick one up at auction for a reasonable price. On that note a knight in shining armour appeared on the horizon in the shape of a chap from William Grant and Sons offering to sort me out a wee sample and a couple of weeks later a package containing not only the Blended Grain but the 6 year old blended Scotch and the stunning 29 year old blend. 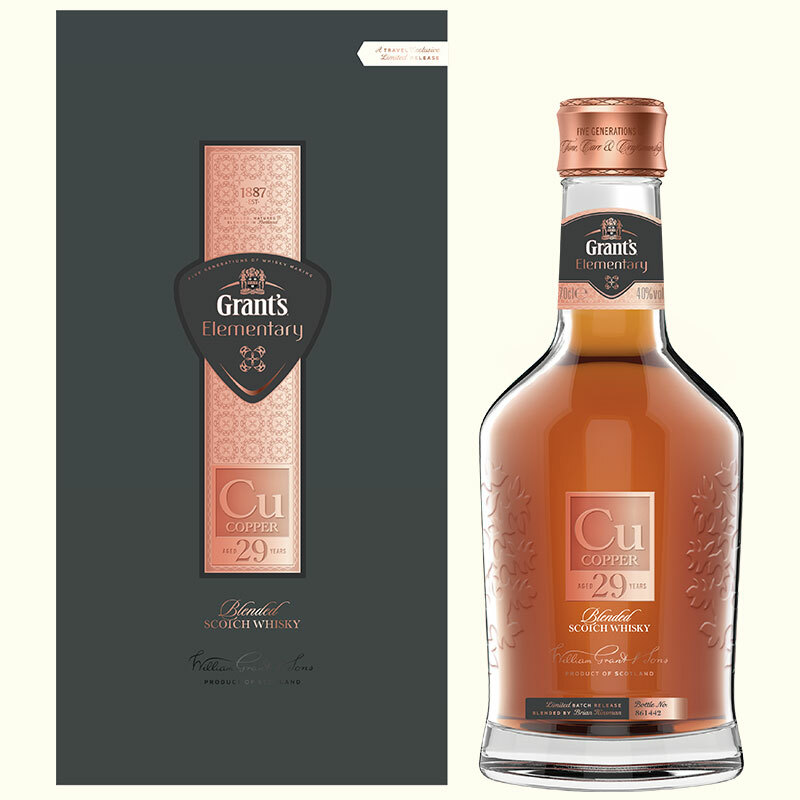 And here we are, I’m sipping on a 29 year old blend from Grant’s, I don’t mind standard Grant’s as a mixer or with a bit of ice so yeah, I was delighted with this. Nose. It’s oak rich, leather and very nearly burnt toffee. I get a touch of smoke in the background. Palate. Oak and honey, smoke and barely sweets. There is some nice grain sweetness too, cola, cherry chews. Finish. Lingering and tangy, oak, cola cubes and vanilla. I’d guess, and because I can read, that this is made up of Girvan, Balvenie and Glenfiddich but I’d say more Glenfiddich than anything else and if you’re a fan of that particular malt. I’m torn on this, it’s a good whisky and a very good blend but as with all these older expressions I wonder if it’s worth it, I don’t even know how much this costs the but the very nice 25 year old is about two hundred quid which is a lot of money for a bottle of Scotch no matter how good it is but that said if you can find it and if the money doesn’t matter then yeah, it’s worth it.